Dr. Robert Rovner, a leading spine surgeon in the Bay Area returns to practicing in Oakland in addition to his Danville location. “Specializing in non-surgical treatments and minimally invasive spine surgery for the best possible outcomes is the mission for our practice,” he says. Oakland, CA – Residents of the Oakland area again have a familiar provider of care for neck and back pain, injuries and related conditions with the return of Robert Rovner, MD’s practice to the city. Known as a leading spine surgeon who practiced in Oakland for many years, Dr. Rovner is pleased to return with the opening of a local office. Dr. Rovner treats patients with worker’s compensation cases as well as offering the latest therapies and procedures for back and neck pain and injuries. Many procedures may be done on an outpatient basis, allowing these patients to go home the same day. Other patients may need only minimal stays for recovery after a procedure. In addition to the new Oakland office Dr. Rovner continues to maintain his practice in Danville. 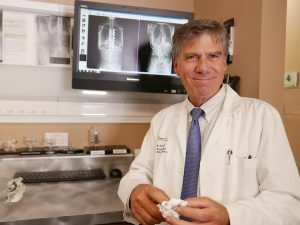 Dr. Rovner was featured in an ABC News story covering his innovations in surgery to correct scoliosis, a condition that causes a progressive curvature of the spine. Another recent story on ABC News showed how Dr. Rovner treated a woman in her 50’s who was suffering from low back and leg pain caused by lumbar spinal stenosis, a common condition characterized by narrowing of the spinal canal. Instead of performing a spinal fusion Dr. Rovner implanted a clip-like device to stabilize the spine after decompression was performed to relieve pressure on the nerves. “This less invasive alternative to spinal fusion preserves range of motion and allows for a more rapid recovery,” says Dr. Rovner. Robert Rovner, MD was raised in Washington, DC. He attended college at the University of Maryland, earning a BS in Zoology in 1975. He completed his MD degree at the University of Maryland in 1979. Dr. Rovner moved to California for his General Surgery Internship and Orthopedic Surgery Residency at the University of California at Irvine from 1979 to 1984 then completed a Fellowship in Spine Surgery at USC-Rancho Los Amigos Hospital from 1984 to 1985. Upon completion of 14 years of medical training Dr. Rovner started in private practice in the East Bay in 1984 and has been here serving patients from Oakland to Livermore ever since. He participates in volunteer time at CCS children’s clinics, volunteer time for scoliosis screening in local school districts and volunteer time as the team physician for one of our local high school football teams. He has been on the volunteer clinical faculty of the University of California at Davis School of Medicine since 1998 and is currently Assistant Professor of Orthopedic Surgery, having spent several years in the Department of Spine Surgery there. Dr. Rovner has been in practice with fellow spine surgeon Vikram Talwar, MD since 2005. In 2015 they created Disc and Spine, a private practice devoted to both surgical and non-surgical spine care with an emphasis on personalized patient care and service. As a team they are able to analyze difficult cases together, and assist each other in surgery, bringing over 50 years of combined clinical practice to bear on challenging cases.